A richly proportioned classic style featuring bold frame and panel construction flanking a delicately arched raised panel apron. 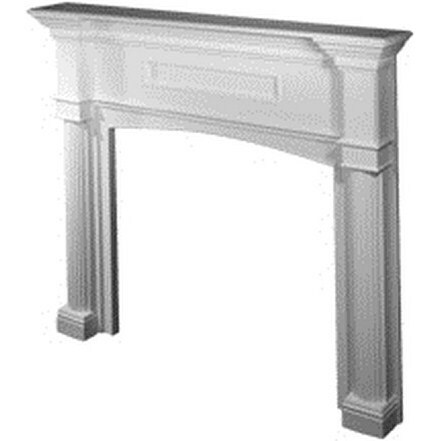 Legs at hearth: 69 1/4"
Mantel shelf length: 75 1/2"
Depth of mantel shelf: 8 5/8"
Offset for facing material: 0 - 7/8"
Adjustable openings make on-site modifications worry-free. Changes in fireplace opening width, height, and allowance for varying thicknesses of facing materials are all easy to do with simple tools. This makes ordering simple, and installation a snap. Each surround is carefully constructed via tight-fitting joints which combine color-matched materials to create an attractive, enduring piece of fine furniture. After inspection, each unit is signed by the craftsman and disassembled for shipping. Each piece is wrapped in protective foam, and double-cartoned to assure it arrives in perfect condition. Available in a variety of solid hardwoods, stained and given a hand-rubbed finish to a fine patina. Popular choices include the aged English look of dark oak, dark cherry which naturally mellows with age, and the traditional painted white finish.